Note: This is the 1st post on the Time Guitar forum. It was copied from Tom's website and then Tom joined and posted the additional comments. to someone else via the Salvation Army. I have since assembled quite a collection, and here's some pics of the prizes in the group. As much as I've ever collected anything, I've tried to collect Time guitars. Music in Burlington VT for $375, with a not-matching (Gibson) hard-shell case. Which year would you guess was this guitar built? How many of these GS9s were built in total? It actually did originally have a brass nut, but in my endeavors to get the G string to stop sticking I've tried everything. That turn through the nut is just awful for tuning. I bought this guitar at Advance, but it was on consignment. The salesman said it had a Time case "but the case was really beat" and he gave me a nice Gibson LP case instead. ...I have since wondered if the salesman wanted to hang onto the Time case for personal reasons. Last edited by ChrisClark on Sat Feb 10, 2007 3:34 pm, edited 1 time in total. I'll down in my basement looking up all my old documents from Time. It was along time ago and I need to refresh my memory on this stuff. I'm thinking this is early 80's. If I find receipts for part purchases, I can really start doing an accurate history. Hopefully this forum will help! I just put this board up last night! Over the years hundreds of the GS style guitars were built. Serials numbers were sequential. Early numbers can be found by lowering the neck pickup. The number is penciled on the end of the neck. Before about 1984...Time Guitars was robbed. I need to check So. Burlington police records for details about the robbery. After the robbery, we started putting/stamping the serial number on the fretboard below the last fret. This made it easier for people [police]to ID the instrument. I imagine the police record has serial numbers listed for the stolen guitars. I just dropped the neck pickup right off of the adjustment screws in an effort to see the serial number. Even with that much droppage I couldn't make out the number! I therefore had to take the pickup off anyway, so strings had to go as did the bridge (and wow it took me a while to find imperial hex wrenches), and off came the pickguard. I grabbed a photo of the underside, once I'd remounted the pickup, and found the serial number to be GS9-113. Unfortunately, as you can see I really did a number on the bridge posts before realizing that they were locked by set screws (this happened many years ago). Anyone know if I can find replacements anywhere, and what I'd look for? The wiring is so neat, though, I'm impressed! Once I get around to replacing the pots on my V I can see it'll be pretty straight-forward. The bridge has 2 set screws clamping that sucker on! You need to get a 3/32" Allen wrench to loosen those. 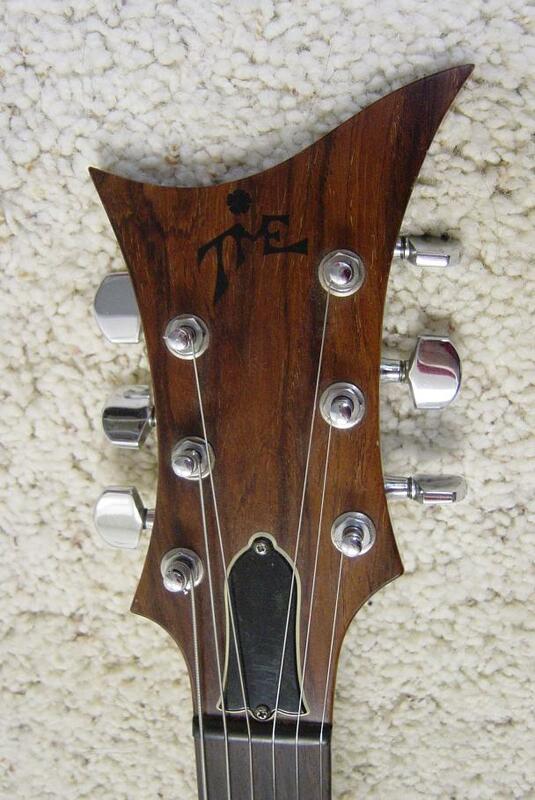 The bridge assembly is a Gibson 'Wide travel Tune-O-Matic' #10521 [made by Schaller]. The stud is #10946. You will find this bridge listed as an 'L6-S' , 'S1' or Harmonica bridge on Ebay and some parts sites. It was used on the 1972-83 Bill Lawrence designed Gibson L6-S, Gibson L5-S, S1, and Marauder M1 guitars. I don't think this part is available from Gibson anymore. Looking at the catalogs at vintageguitars.org.uk you can see this bridge was also used on some Les Pauls ans SGs at the time. The Set screws were added at Time to make it more solid. This is a nicer bridge than the typical 'Tune-o-Matics' of the period.